by Rebar, Cherie R.; Gersch, Carolyn J. 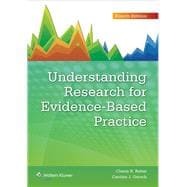 Develop the knowledge and skills you need to become a research-literate, evidence-based practitioner with this user-friendly book. Mirroring the way practicing nurses read research reports, the book begins with a research article’s conclusion—the section that most directly addresses the clinical meaning of a research study—and works “backward” through each section in the research article. Organized around user-centered questions, such as how conclusions were reached, which patients the conclusions apply to, and how the study was done, each chapter begins with a clinical case that identifies the clinical question the nurse is seeking to answer and one or two published research articles that directly relate to the clinical case. See the relevance of research to clinical practice through the authors’ unique approach that helps you learn about research methodology in a natural, intuitive way. Explore the ways that becoming research literate will help your clinical practice with Rebar & Gersch Evidence-Based Bridge Theory. Increase your understanding of difficult, abstract concepts through visually dynamic graphics. Broaden your knowledge with enhanced coverage of two important forms of nursing research—systematic reviews and mixed method research, including the AAAAA Evidence-Based Practice Model. Become a savvy consumer of research with an easy-to-understand review of the basic statistical information necessary for interpreting research studies. Access clinical cases that reflect nursing practice in a variety of settings, from acute care to public health and across a range of specialties. Find the information you need fast with anytime, anywhere access to the fully searchable text online.